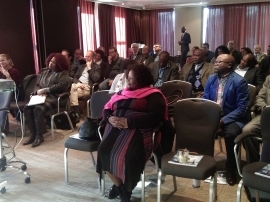 On the 24th of February 2017, SANEC and the South African Embassy in the Hague had the esteemed privilege to organize a formal roundtable for the South African delegation, who formed part of the Eastern Cape Provincial Legislature, for a market study visit to the Netherlands. The roundtable was an opportunity for the Dutch business community to review opportunities that are present within the Eastern Cape Province. The roundtable served as an important follow-up by Missions of relevant eastern cape government officials, including the MEC of Eastern Cape Province, Mr. Sakhumzi Somyo (2015) as well as another trade mission (2016) that comprised of The South African Infringement Agency, The South African presidency and the Ekurhuleni Metropolitan Municipality representatives who had extended their willingness to work and collaborate with Dutch companies for Operation Phakisa. The event had begun with the Deputy-Head of the South African Embassy, Mrs. Namhla Gigaba thanking all participants for being present on the day, which was then followed by a warm welcome to our members present on the day, by our Exco-Board Members which consisted of Mr. Abel Dutilh and Mrs. Janet Poot. The Portfolio chairperson of the committee, Mrs. Nolwethu Gqiba inaugurated the team she had travelled to the Netherlands with, so that during the break, participants would have the opportunity to engage in discourse, to discuss opportunities and potential in the Eastern Cape. SANEC would like to take this opportunity to thank Lisette Bakker from DELPHY (formerly know as DLV Plant) for the presentation she had done on the day, which was truly insightful and highlighted knowledge sharing possibilities for the Eastern Cape Region to work hand in hand with Dutch organizations to increase sustainable developments in the Agro-sector. For a photograpic impression of the roundtable, please have a look at our Facebook page here and do not forget to give us a like!